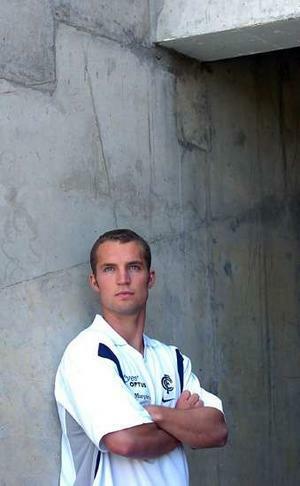 Ross Young was the first player chosen under the new mature-age rookie rule that allowed each club to pick one untried prospect aged 23 or more and Carlton was one of only two teams to take up the offer. (Adelaide was the other club). He was Carlton's third round rookie pick (#32 overall) and their 2nd player recruited from the VFL (with North Ballarat's Michael Jamison). Ross Young was originally from Donald and had played with the Bendigo Poineers U18s side in the TAC Cup in 2001 (when he was listed as 178cm (5'9½") and 65kg (10.3)), he then went and played with the University Blues Football Club and had played the last two seasons at the Northern Blues, (coached by Barry Mitchell, Carlton's aligned club). Ross played in 20 games for the Bullants in 2005 and scored 17 goals and during the 2006 season played 14 games and scored 12 goals. He was injured early in the first final of 2006 against Williamstown and the 'ants missed his drive in the remainer of that game and the rest of their finals games. He was also injured in the night game at Bendigo in the 'Ants third game of the 2006 season and missed more games. In Round 6, after a number of solid games at the Northern Blues, Young was not only promoted to the senior list to replace the injured Nick Stevens but was selected to debut against St Kilda. He ended up playing in a side that lost by 43 points but his own performance was impressive as he racked up 13 disposals. A week later, Young kicked his first goal at AFL level. After 3 games in the seniors, Young lost his place for the Round 9 fixture v. Adelaide as the Blues went tall to try and beat the Crows, but would return for the Round 13 away clash against the Dockers, kicking 2 goals in our only real surge in a disappointing day. He played the next 2 games but the Round 15 fixture vs. the Swans would turn out to be his sixth and final game and he failed to earn selection again. He was not retained by the club beyond 2007. He continued his career with Perth in the WAFL in 2008 and played also aside his brother Seamus and won the Sandover medal in 2009 when he polled 45 votes. Contributors to this page: Bombasheldon , molsey , WillowBlue , BlueWorld and true_blue24 . Page last modified on Friday 26 of April, 2013 20:34:30 AEST by Bombasheldon. 2003 - Calder Cannon Brock McLean. 1974 - Alex Ruscuklic change over time.